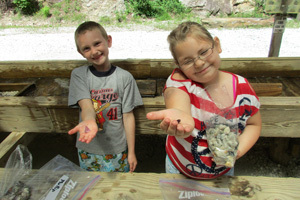 One of the most exciting aspects about Emerald Village is the opportunity to prospect for gems and keep what you find. The special thing that sets Emerald Village apart from all the other “gem mines” is that we do it in REAL mines that have produced a variety of gems and minerals. 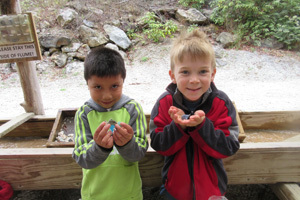 Our North Carolina Gemstone Mine is located in the awesome Big Deal Mine, an impressive historic underground mine that produced a variety of gems and minerals. These mines are closed now but provide a spectacular backdrop! 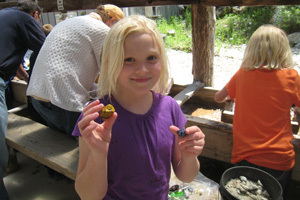 The Gemstone Mine is all about having fun in a comfortable, spectacular setting. We have two long covered flumes that run with cold mountain water. Mine for gems regardless of what the weather does. Our staff will explain the various gem buckets available and how to search for gems. We’ll help you identify what you find and our trained professionals will take your order to cut and polish your special finds and make them into attractive jewelry. What a great memento of your visit! No reservations are necessary at our Gemstone Mine and we provide the equipment. Wear comfortable clothes but we’ve done the dirty work by providing buckets of gem-bearing materials to search through. All our buckets (except the Native Bucket) contain ore mined from local mines, along with rough gems added from other mines so we can guarantee “A Gem Find Every Time!” The mixed buckets contain up to 25 different mixed varieties of gems including Amazonite, Amethyst, Aventurine, Aquamarine, Carnelian Agate, Citrine, Emerald, Fluorite, Garnet, Kyanite, Moonstone, Opal, Red Jasper, Rose Quartz, Ruby, Sapphire, Smoky Quartz, Sodalite, Topaz, Tourmaline, Unakite, and others.